Music hath charms to soothe a savage breast, - Congreve. “How could you, Estel?” Arwen demanded the moment Aragorn entered her sitting room. The Queen’s beautiful face was alight with fury. Beside her, stood an equally irate Éowyn. “You promised me that last time,” Arwen said coldly, unmoved by her husband’s attempts to apologise. Knowing it was pointless to argue with either lady when they were so angry, a crestfallen Aragorn went in search of his Steward. He found Faramir sitting in his apartments looking equally despondent, having found an irate letter left for him by his angry wife. “Éowyn bids me do the same,” said Faramir. He glumly followed the King to his chambers. The two men found Aragorn’s rooms to be cold and uninviting. The King only used them occasionally and the servants had had no time to prepare them for his use. It took only a moment for both men to decide to seek solace in a tavern on one of the lower levels. “It is good for a King to mix freely with his people and learn their needs,” said Aragorn, by way of excuse. He rummaged amongst his clothing for old cloaks and tunics for himself and Faramir. The two men were soon sitting in the cosy inn in the sixth circle, their hoods drawn around their faces to avoid recognition. They sipped a mug of ale apiece, wondering why the tavern was so packed that night. “Have you come to hear Minohtar play?” asked the innkeeper, bringing them a plate of crusty bread and cheeses. 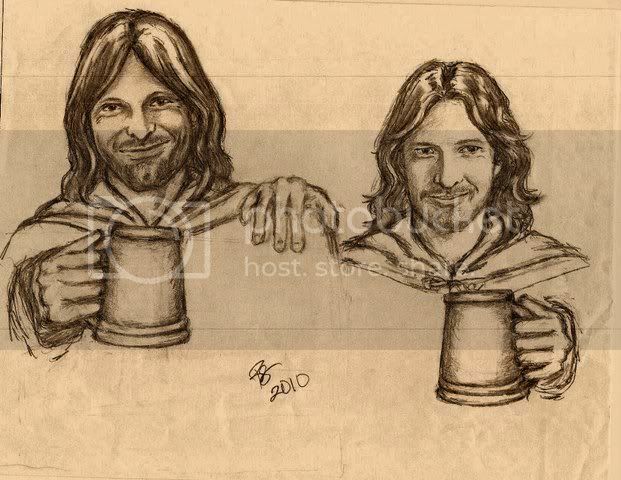 Aragorn and Faramir merely nodded, not wanting to betray their ignorance of the name. A hush fell over the gathering, when in the far corner; a man picked up a lute and began to sing. His voice was unexceptional in contrast to his skills with the instrument. The haunting song of love and longing he played, brought tears to the listeners’ eyes. He next performed a familiar ballad, which most of the people joined in with, including Aragorn and Faramir. “That could be a good idea,” Faramir said thoughtfully, tossing the girl a coin for the ale. “Why not? We could but try!” said the King, draining his glass and feeling somewhat more confident. "Maybe Arwen will recall how I was singing the Lay of Lúthien on the day we first met?" King and Steward hurried back to the Citadel and positioned themselves outside Arwen’s sitting room window and began to sing. “ O, thou my glorious Evenstar, I have always gladly greeted you. This heart has never betrayed you!” sang Aragorn’s rich bass voice in Quenya, so that the servants would not understand. “Éowyn, fairer than the sun, glad was I when your hand I won!” sang Faramir in Rohirric; his warm baritone blending nicely with Aragorn’s deeper voice. The servants hovered around, enjoying the impromptu concert. Aragorn embraced his wife. ”Will you forgive me, beloved?” he asked. Arwen’s tender kiss to his lips was the only answer he needed. King and Steward exchanged relieved glances as they bade one another goodnight. Faramir carried Elestelle in his arms as he walked back to his apartments with his wife. The Steward at once began a lullaby for his daughter. The little girl listened entranced then fell soundly asleep. “It is said that the Valar created Arda itself from music. So maybe magic is indeed contained in a song?” Faramir mused. “Only if the singer has sufficient skill,” said Éowyn, smiling at her husband. A/N. Aragorn’s song is from Wagner’s Tannhäuser.